After the Cherry Mobile Skyfire, Cherry Mobile unexpectedly announced another 4.7-inch Android ICS smartphone called Cherry Mobile BLAZE! 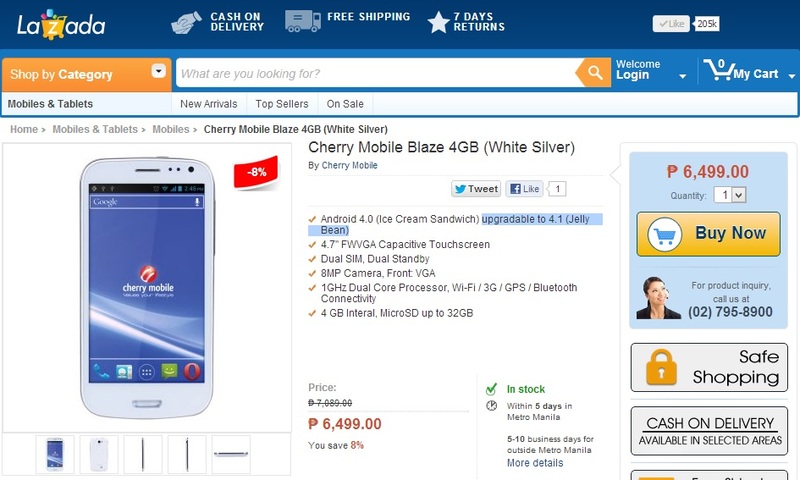 For only Php6,499 (SRP), the Cherry Mobile BLAZE boasts a 1GHz dual-core processor, a dual-SIM, dual-standby capability, an 8MP autofocus camera with LED flash and runs Android 4.0.4 Ice Cream Sandwich as its OS. 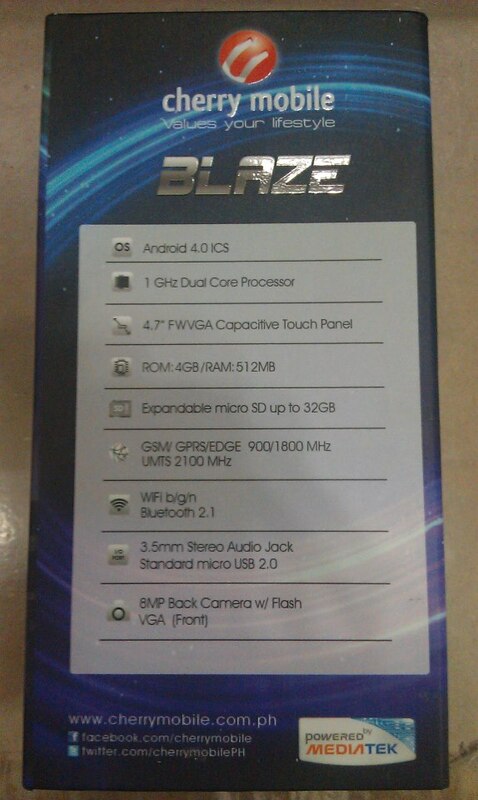 More about the Cherry Mobile BLAZE specs and features after the jump. - Some of the specs of the Cherry Mobile BLAZE is still not available at this moment. We'll update this post once we know more about the specs of the Cherry Mobile BLAZE, so stay tuned! - If you found something in the internet about the OEM of the Cherry Mobile BLAZE, just let us know. Thanks! (12/28/12) The Cherry Mobile Blaze or Ming Ren A2. Thanks Leamsi Ylre for the tip! Yup, maliit kasi ung battery capacity ng Blaze. 1,500mAh lng kasi. bkit ung sken 2-3 hours na gaming sa cm blaze lowbat agad ..? gnun po ba tlga un >? pwede ba ung battery ng s3 dito sa Blaze?? Meron po at kasama na po yan sa Android 4.0 ICS (OS). may MP3/Mp4 player ba to? bat wala sa specs? maganda rin po ba quality ng cm blaze like my phone? Sakin po kung hanap mu yung malaking display/battery capacity at USB-OTG support sa MP A919 Duo, sa performance/display quality (4.5-inch qHD IPS display) yung MP A888 Duo at kung ngtitipid at Galaxy SIII look alike yung CM Blaze . Lahat nmn po cla meron MediaTek MT6577 processor, PowerVR SGX531 GPU, 512MB RAM, 4GB ROM at 8MP po yung cam. Sakin po tingan mu nlng yung display size na gusto mu, dahil 5-inch, 4.7-inch at 4.5-inch yung pinagpipilian mu. At yung additional features like TV-out, USB-OTG at battery capacity. ano po mas maganda cm blaze , my phone a888 or a919? need ur suggestions lng po. balak ko po kcing bumili this month.